In “The Passage” and “The Twelve“, Justin Cronin brilliantly imagined the fall of civilization and humanity’s desperate fight to survive. Now all is quiet on the horizon but does silence promise the nightmares end or the second coming of unspeakable darkness? At last, this bestselling epic races to its breathtaking finale. The City of Mirrors is on my list of most anticipated books of 2016 – and with such a long wait after The Twelve – it was soooo worth it. After over three years since the last book in this series was published, I needed reminders about what had happened to these characters and the author worked that into the beginning chapters in a clever way – things filtered through that foggy curtain in my mind and I couldn’t wait to get on with the story. And what a story this is. I don’t know if I can do it justice. Peace, war, family, friendship, revelations, death, life, sacrifice, love – all are contained within this epic novel that’s such an incredible, bittersweet ending to The Passage trilogy. All questions are answered – where did Amy go and what happened to the world? What happened to Zero in his human life that spawned such hatred? What about Peter? Alicia? Sara and Hollis? I’d forgotten how deeply I care about these characters and although I hate to see the series end, I feel as if I had closure in learning their fates – good or bad – by the last page. This is a hefty chunk of a book, but what a journey it is. I laughed, cried (and it takes a lot to pull the tears from my ducts), put off most household chores for nearly a week while reading this, and I’m pretty sure my heart stopped a few times. Unparalleled characterization, thought-provoking concepts, and brilliant writing. If you haven’t started reading this series – what are you waiting for? 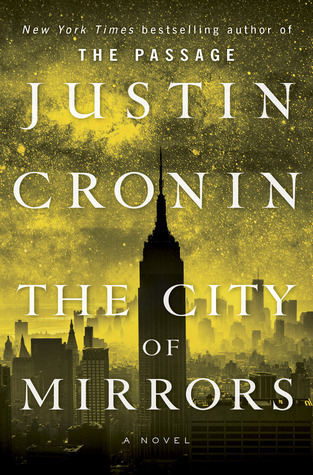 The City of Mirrors is scheduled for publication May 24th, 2016. Thanks to NetGalley for the digital ARC in exchange for an honest review. Thanks! It’s hard to express how amazing this book was – hope you enjoy it!